Over the years as I’ve interacted with some of the fastest growing churches in the country, I’ve discovered an interesting common thread running through them … they all spend a lot of money on t-shirts. 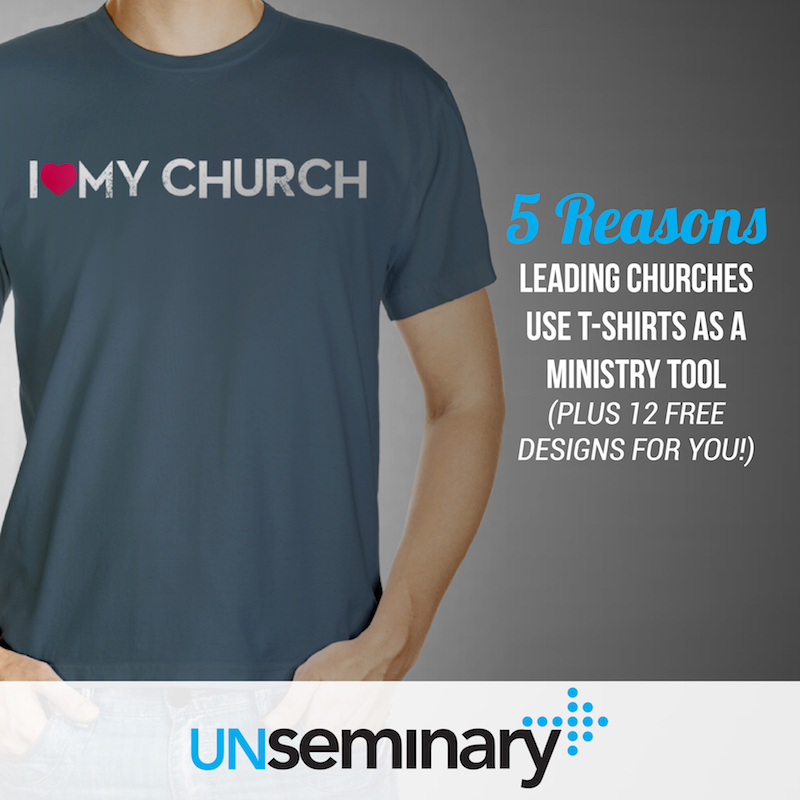 In fact, the topic of “t-shirt strategy” often pops up in conversation with the leaders of these churches. About two years ago, I had the privilege of sitting in on the leadership team meeting of one of the largest and fastest-growing churches in the country. The conversation turned to t-shirts because the Lead Pastor wanted to give away a free shirt to everyone who attended on an upcoming weekend while the budget folks weren’t so sure. It was such a funny conversation to listen in on because I’ve had the exact same one at my church! Welcomes Guests // When we switched our “new here” guest gift to a t-shirt, our responses on connection cards immediately jumped. It’s hard to follow up with guests if we don’t have their contact information. Giving away a t-shirt gets us the information we need! 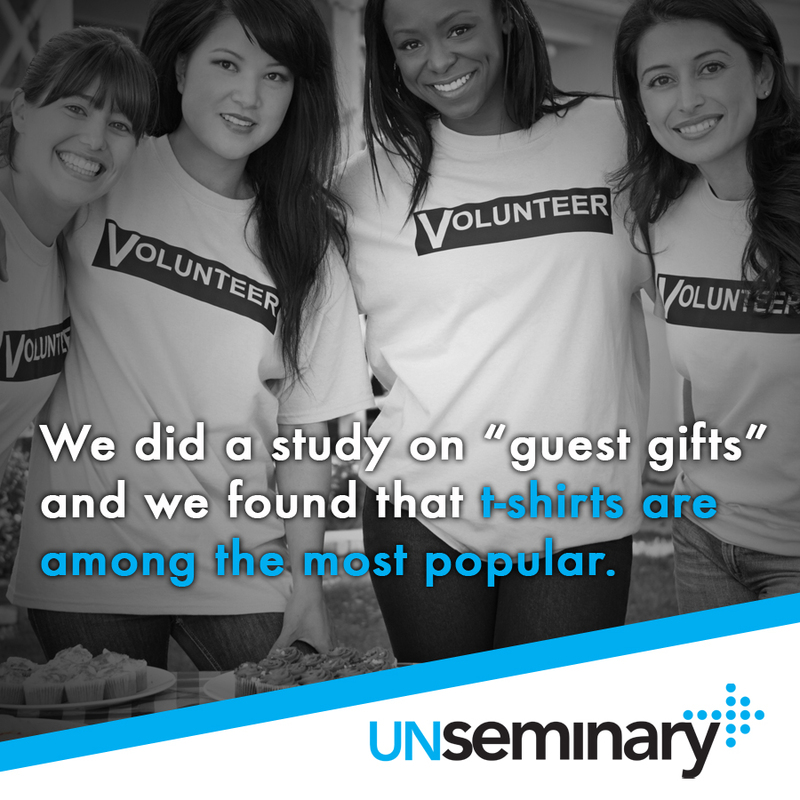 We did a study on “guest gifts” and we found that t-shirts are among the most popular items with this group of people. In fact, many churches are using t-shirts as a free giveaway on “big days” to help drive invitations to their weekend services. Helps Newcomers // When people arrive at your church they are confronted with a myriad of decisions about where to go and what to do. Having your guest services team wear the same shirt helps people identify who can help them. It creates an invitation to approach a stranger and ask questions. Of course, your team is ready to help visitors but sometimes your guests need a little nudge in the right direction. “I’m a part of the tribe!” // Teams wear uniforms. By giving people a t-shirt, you’re inviting them onto a team! It is a way to show appreciation to the people who make your church happen every week. 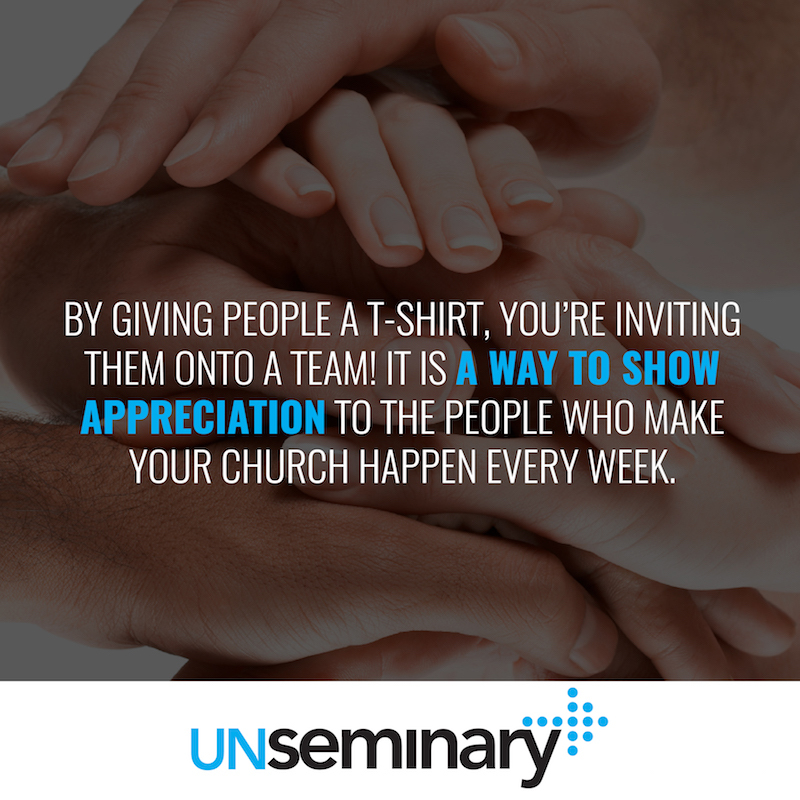 Church leaders are always looking for ways to show appreciation and t-shirts are a quick way to do it! Perceived Value // There is no doubt that t-shirts cost a little more than some other giveaways but their perceived value is much higher. It’s cheaper to make t-shirts than the people who receive them realize. People love getting a free, well-designed t-shirt … leverage this fact. Walking Advertising // We have created some designs over the years that people actually wear in “normal life.” This creates a walking advertisement for our church. 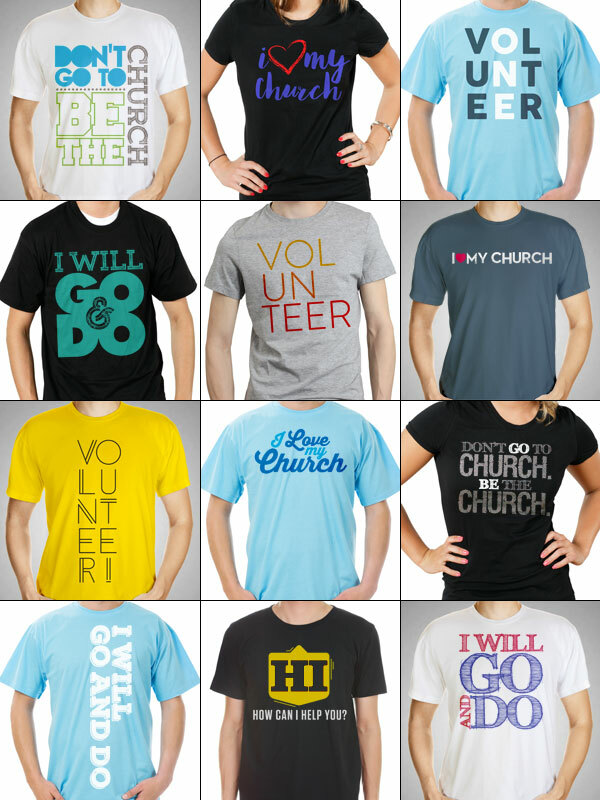 T-shirts are a natural tool to help people start conversations and invite their friends to church. Our friends at Design Pickle have pulled together a dozen great t-shirt designs for you to use in your church. [Click here to receive t-shirt designs in your inbox instantly.] Take the designs, pass them along to a t-shirt printer and you’re good to go. We’ve also provided the “source files” so a designer can modify the designs to fit your church. Of course, you could also use Design Pickle’s flat rate, unlimited revision service to modify these designs to fit your needs. I am the hospitality coordinator at my church I love this idea! Just curious about a few things: Do you provide a shirt for everyone in the family? Just the adults? What kind of sizes do you stock at any given time? Only one style? Men’s and women’s cuts? Thanks for stopping by, Christa! I’ve seen churches primarily give shirts to adults after they fill out a first time guest connection card of some kind. (Often children might be directed to attend the children’s program and receive some sort of other gift there). My church kept unisex adult sizes in stock from S through 3XL but M, L and XL were the most popular sizes. New guests love them! Help. I lost my file that was emailed to me and now when I sign up I receive the media for social media campaign and not the t-shirts. Any way you can help me out? Love these ideas. I am going to send over this post to my mom and dad, who help run a church here in Texas!